Katherine Ashley, the clever, beguiling daughter of a poor country beekeeper, catches the attention of powerful, ambitious Thomas Cromwell-henchman for King Henry VIII. Cromwell secures for Kat a place in the royal court, but as a reluctant spy. Plunged into a treacherous game of shifting alliances, Kat is entrusted by Anne Boleyn to protect her daughter, Elizabeth. In the face of exile, assassination attempts, imprisonment, and a romantic flirtation that could cost the young princess dearly, Kat will risk everything-even her own secret love-for her bright, clever Elizabeth. 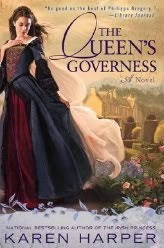 I've heard of Kat and her special role with Elizabeth and Anne, but I admit I know very little of the governess who helped raise one of the world's most famous queens. At first, I was not sure how I liked the format. The author decided to make it seem like Kat was writing a novel of her past. I grew to like it and it worked, but I did not like the random add-ins in the middle of paragraphs.It ruined the pace of the book I felt. I get that they were for further explanations or little snipbits of future events. I like Kat a lot. She was a such a strong character even in her weak moments. She felt so real and if she was half of what the author presented, I can see how she influenced and helped strengthen a strong woman. Anne Boleyn would've been proud of who helped raise her daughter. I am glad Kat got her HEA. I was worried she was going to be all alone in a loveless marriage. She deserved to be loved. This was really good. I liked how the characters were presented and I liked how the stories were shown. There were time skips for sure, but I felt it was important. I do wish there had been more time spent during Mary's reign. It did seem a little short for how scary that time period it was. In the end, I'll give this 4 stars. Really good and I recommend it if you like historical fictions. Melliane, sometimes a different format is refreshing if done right. B, she was in the shadows because of Queen Bess and her mum.